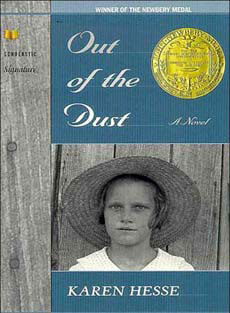 Out of the Dust was the first Karen Hesse book I read, and from there I was hooked! Written entirely in free verse, this compelling book tells the story of Billie Jo and her family as they face death, poverty, and the pervasive drought and windstorms that have ravaged their Oklahoma farm. As depressing as a story about surviving the dust bowl may sound, the portrayal is quite moving and ends with hope for their future. Readers really get a feel for what life was like for Dust Bowl children and how residents helped each other and held on to the hope for a better tomorrow. Billie's flight west also provides a powerful portrayal of the historic migration that accompanied the Dust Bowl. Overall, this book is NOT to be missed! School Library Journal called it "a triumphant story, eloquently told through prose-poetry." And, in a starred review, Publisher's Weekly said "This intimate novel, written in stanza form, poetically conveys the heat, dust and wind of Oklahoma. With each meticulously arranged entry Hesse paints a vivid picture of her heroine's emotions." We have included this book on the Newbery Winners list and Dust Bowl books list, but...if we ever do a list of the best chapter books written in free floating verse, this will be at the top. This is obviously an excellent mentor text if you are teaching this type of writing style in your language arts curriculum! -Newbery Medal Winner for 1998! We love book covers! We admit it...we judge books by their cover. How could you not when some of them are just so dang cool! Below are the different choices for this book. We like them all, especially with that big Newbery Medal on it!